January 30th-The actual invasion of South Carolina has begun. The 17th Corps and that portion of the 15th which came around by way of Thunderbolt Beaufort moved out this morning, on parallel roads, in the direction of McPhersonville. The 17th Corps took the road nearest the Salkahatchie River. We expect General Corse, with the 4th Division of the 15th Corps, to join us at a point higher up. The 14th and 20th Corps will take the road to Robertville, nearer the Savannah River. Since General Howard started with the 17th we have heard the sound of many guns in his direction. To-day is the first really fine weather we have had since starting, and the roads have improved. It was wise not to cut them up during the rains, for we can now move along comfortably. The well-known sight of columns of black smoke meets our gaze again; this time houses are burning, and South Carolina has commenced to pay an installment, long overdue, on her debt to justice and humanity. With the help of God, we will have principal and interest before we leave her borders. There is a terrible gladness in the realization of so many hopes and wishes. This cowardly traitor state, secure from harm, as she thought, in her central position, with hellish haste dragged her Southern sisters into the caldron of secession. Little did she dream that the hated flag would again wave over her soil; but this bright morning a thousand Union banners are floating in the breeze , and the ground trembles beneath the tramp of thousands of brave Northmen, who know their mission, and will perform it to the end. In November 1934 Major General Smedley Butler made headlines by alleging that he had been in contact with businessmen since July 1, 1933 who wanted him to lead a coup attempt against FDR. The allegations became known as the Business Plot. Congressional hearings concluded that there might be some substance behind the allegations, but that they could not be confirmed. Contemporary press accounts indicate a wide spread belief that Butler fabricated the whole thing. Butler was passed over as Commandant of the Marine Corp in 1931 because he publicly accused Mussolini, falsely, in a speech of having run over a child. He never got over it and he ran unsuccessfully for the Senate in 1932 as a Republican. He then turned hard left, attacking capitalism and the military as being gangsters for the capitalists. That is what makes his entire idea of a fascist plot against FDR so laughable. By 1934 he was known as an ardent supporter of FDR and yet shadowy plutocrats wanted him to command a coup against Roosevelt? FDR obviously thought it was rubbish as there were no criminal prosecutions by the Feds of anyone named by Butler. Butler was a very brave man as attested by his two medals of honor. He was also a fabulist, to put it politely, of the first order. My wife and I, the kids are back in college and law school, saw American Sniper at a movie theater in Morris, Illinois on Saturday January 24. It was the second performance of the day, beginning at 1:00 PM, and the theater still was almost full. After seeing the movie, the one term that seems to me to apply is stunning, in every sense of the word. Clint Eastwood has made a masterpiece, the finest of his movies as a director, and made a film biopic that perfectly captures the man Chris Kyle and his times. It is not a film for kids due to intense combat scenes and frequent use of the f-bomb by troops. My review is below and the usual caveat as to spoilers is in force. The movie opens with scenes from Kyle’s childhood. He and his father are hunting and Kyle kills his first deer. We then see him as a young boy at a church service listening to a minister preaching a sermon. The minister notes that we see our lives as a series of events and that we do not see the pattern of our lives that God sees, especially since we do not see as God sees. During the sermon Kyle fingers a blue bound Bible that he will carry for the rest of his life and which appears in many scenes in the movie. The sermon establishes the method of the movie which consists of vignettes as Kyle proceeds through life. When he intervenes in school to defend his younger brother from a bully and beats the daylights out of said bully, his father explains to him that night that people are divided up into three groups: sheep, predators and sheepdogs who protect the sheep from evil and harm, and that he and their mother are not raising either sheep or predators. As a young man we see him as a rodeo performer, marking time in his life. A television news bulletin about an overseas bombing of a US embassy enrages him. We next see him enlisting in the Navy to be a SEAL. SEAL training is displayed with humorous touches emphasizing how rigorous it is. After he becomes a SEAL he meets his future wife and their relationship stateside is the counterpoise throughout the film to the War in Iraq. They are married shortly after 9-11. The bulk of the movie consists of his four tours in Iraq, interspersed with scenes at home. In Iraq Kyle quickly becomes a legend. In fact, that is the nickname he is given by the Marines he serves with: “Legend”. As a sniper he provides cover for the Marines as they go door to door in the type of urban fighting that typified much of the Iraq conflict. My guess is that this film will give most Americans their first true understanding of what the fighting in Iraq was like. Nineteenth century writer Ambrose Bierce, “Bitter Bierce”, once observed that wars, he was a combat veteran of the Civil War, were God’s way of teaching Americans geography. Sometimes a good film can perform the same function of teaching the general American public the grim realities of combat, and American Sniper does that for the fighting in Iraq. Peaceful settings can become deadly in an instant, and the line between enemy combatants and innocent civilians is thin to non-existent. The fighting is shown as being intense and deadly, albeit usually brief. Kyle eventually joins the Marines in their house to house fighting to show them SEAL techniques that might help save some of their lives. Kyle is the very essence of a hero: someone who goes into danger for others, in spite of the risk to his own life. The Iraqi Jihadists, who called him The Devil of Ramadi, put a bounty on his head. When it reaches $120,000 in the film Kyle jokes that it might tempt his wife on one of his bad days at home. We see the moral quandaries that arose for Kyle as women and kids are used by the Jihadists against the American troops. We see Kyle shooting one boy and a woman as they attempt to attack an American convoy. Later in the movie we share Kyle’s relief when a boy puts down an rpg and runs away. Kyle notes however that he regrets none of the shots he made. What haunts him are the American troops he was unable to save. There is almost no politics in the film. Kyle is an uncomplicated patriot who views the US as the greatest nation in the world and sees it as his duty to defend her. Some of his friends do come to question the Iraq War, viewing it as not worth the cost in American lives. That such an apolitical film has aroused the ire of the Left is unsurprising however. The American fighting men in this film are depicted as ordinary men performing heroically in very tough circumstances and that does not play into the stereotype of the Left of American troops being losers, victims or monsters. The tours in Iraq take a toll on Kyle and eventually his wife convinces him to leave the SEALS, his War finally coming to an end. In civilian life, he volunteers to help troops with physical and mental problems. On February 2, 2013 he was slain by a 25 year old former Marine he was attempting to help. No explanation exists for the slaying. The film ends with scenes from the funeral of Kyle. No one moved in the theater until the film was completed. I think most of the audience was just as stunned by the film as I was. Bradley Cooper gives a career making performance as Kyle, portraying him as a complete human being. It is a three dimensional performance that causes us to care about Kyle as we view the arc of his life. Men like Kyle deserve to be remembered. American Sniper is a fitting tribute to a man who went into harm’s way for the rest of us. Whereas, In the mysterious providence of an all-wise God, we are called upon the mourn the loss of our beloved commander, the late Col. Holden Putnam, who was killed in the battle of Chattanooga, Tenn., November 25th, 1863; therefore, Resolved, That the heart which ceased to beat when he fell upon the crest of Tunnel Hill, bearing down with him the emblem of our national life, yet speaks to us of the brave and efficient officer, the genial friend, and the earnest soldier. Resolved, That the regiment has lost a friend and valiant leader and faithful commander; the country a true and pure patriot, and an unselfish son; his fellow citizens an active and generous helper and a noble delegate in arms. Resolved, That we tender our heartfelt sympathies to his bereaved family and friends, and pray that God may assuage the grief of the household. Resolved, That a copy of these resolutions be transmitted to the family, and also sent for publication to each of the county papers of the counties represented in the regiment. The paradox of war for any good man who fights in one: taking lives to save lives. I will report back as to whether the film American Sniper is successful in addressing this paradox. Gentlemen, you will never make peace with Napoleon! Napoleon cannot be master of the world until he has smashed us up, and believe me, gentlemen, he means to be master of the world! You cannot make peace with dictators. You have to destroy them, wipe them out! Something for the weekend. Heart of Oak from That Hamilton Woman (1941). Sir Winston Churchill died 50 years ago today. He loved that film, echoing as it did his own struggle against Hitler in the earlier stand of Great Britain against Napoleon, and would frequently show it to guests during the War. Upon this battle depends the survival of Christian civilisation. Upon it depends our own British life, and the long continuity of our institutions and our Empire. The whole fury and might of the enemy must very soon be turned on us. Hitler knows that he will have to break us in this island or lose the war. If we can stand up to him, all Europe may be freed and the life of the world may move forward into broad, sunlit uplands. For a friend who recently passed away and who served his own tour of duty in Vietnam. He loved the television show Tour of Duty (1987-1990) that followed a platoon of American soldiers in Vietnam. CBS failed to purchase the rights to the Rolling Stones’ Paint It Black for reruns or DVDs, so replacement music is used instead, which is a great shame. I have seen few videos more evocative of time and place than the intro to Tour of Duty with Paint It Black. The second and third seasons of Tour of Duty added soap opera and adventure elements which detracted from the realism of the show, but the first season is highly recommended by me for anyone wishing to see a realistic depiction of what life was like for the men who fought one of America’s more unpopular wars and who usually served their country far, far better than their country served them. By the 18th Century Spain’s glory days were in her past, and her time as a great power was rapidly coming to an end. It is therefore somewhat unusual that at this period in her history, Spain added to her vast colonial empire. It would never have occurred but for the drive of one Spanish governor and the burning desire of a saint to spread the Gospel of Christ. Miquel Josep Serra i Ferrer was born on the island of Majorca, the largest of the Balearic islands, off the Mediterranean coast of Spain on November 24, 1713. 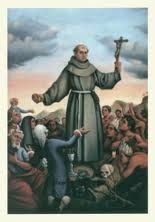 From his youth he had a desire to join the Franciscans and on September 14, 1730 he entered the Order of Friars Minor, and took the name of Junipero after Saint Junipero, one of the closest companions of Saint Francis. 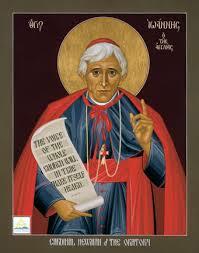 He had a sharp mind, and before his ordination to the priesthood was appointed lector of philosophy. He would go on to earn a doctorate in philosophy from Lullian University and went on to occupy the Duns Scotus chair of philosophy there. A quiet life teaching philosophy was his for the asking. Instead, he went off to be a missionary in the New World in 1749. His first assignment was to teach in Mexico City, but that was not why he had left the Old World. At his request he was assigned to the Sierra Gorda Indian missions in Central Mexico as a mission priest, a task which occupied him for the next nine years.